Your company and customers rely on the ability to be able to reach you in a timely and efficient manner. ClarityTel revolutionizes your one-on-one experiences with clients with a reliable, clear communication system. ClarityTel provides end-to-end voice solutions for small and medium businesses. From deployment to post-implementation support, we’ll help you modernize your phone system and unify communications. Nationally recognized as a leader in VoIP telephony service, ClarityTel’s integrated VoIP phone service solutions bring all of the features you would expect from a Fortune 500 phone system at a fraction of the cost. Unlike competitors that advertise a low price and then add monthly costs for additional features or a short-term discount for contract terms, we give you everything for one low month-to-month rate. Unlimited calling – No more per minute fees in the USA and Canada. No package plans – We give you everything for one low price. No phone closet – Enjoy cloud-based technology with no equipment to maintain. No contracts – We sell service. Crystal clear voice – Count on ClarityTel’s VoIP phone service. Reliable – 99.999% uptime so you can attend to more pressing needs. Disaster recovery – ClarityTel can create solutions for any event in your area. Fast provisioning – We will get your account and service set up on your schedule, not ours. VoIP technology – 35 plus advanced calling features included per user. Global network – We can assist you with specialized needs anywhere in the world. 24/7 customer service – Our trained specialists are here to help with any after-hours emergency. Personal touch – All of our departments are staffed with seasoned telephony experts. Get the next generation of VoIP phones. If you do not already use a VoIP phone service in your office there are a few considerations you must first address before switching to ClarityTel. Moving from a traditional telephone service (analog lines) to voice-over-IP (VoIP) requires sufficient bandwidth, a proper switch and router, and a good battery backup solution to protect you from power failures. Bandwidth – Does your office have sufficient bandwidth? Minimum requirements for VoIP phone service are 400K upload and download. Do you have an appropriate router? Choosing a low quality or underperforming router is a costly mistake which will degrade your call quality and cause service issues when deploying VoIP. Quality of Service - Decide whether voice traffic will be separated from regular internet users or will share the same network. 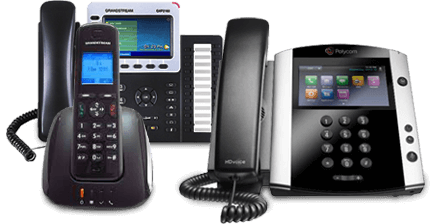 What VoIP Phone Equipment do I need? There are many digital office phones, soft phones, headsets and telephone adapters on the market. Making sure you have the best one for your environment is critical. Also, as Voice over IP does not work when the power, you should install a battery backup system and possibly a Power-over-Ethernet switch if your budget permits it. ClarityTel offers many other disaster recovery solutions, so contact us today! If you are new to VoIP, there are many questions that you may need answered. ClarityTel's sales staff is the best in the business at understanding your office environment and making appropriate recommendations. Give us a call or use the contact us button and we'll gladly assist with your company's needs. If you can’t find the answer to your question, please contact us. We’ll be happy to help.